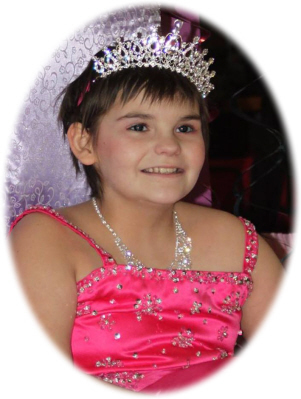 Alexis Jean "Lexie" Schueller age 8 of Ovid, MI, passed away Thursday, September 6, 2018 surrounded by her family at Sparrow Hospital, Lansing, MI after a courageous battle with cancer. Funeral Services will be held at Smith Family Funeral Homes - Houghton Chapel, Ovid, MI, on Tuesday, September 11, 2018 at 1:00 P.M., with Pastor Tim Dickinson officiating. Burial will take place at Fairfield Township Cemetery, Elsie, MI. Visitation will be held on Monday, September 10, 2018 from 2-8 P.M. with family present from 2-4 & 6-8 P.M. at the funeral home. Alexis was born in Owosso, MI on January 28, 2010. Lexie loved to sing and dance. She loved anything Disney, especially Princesses. Lexie enjoyed Michael Jackson and Taylor Swift music. She will be remembered for her sassy attitude. Lexie and her sister, MacKenzie spent a lot of special time together. Lexie was an adopted friend of the Clinton County Sheriff's Department. She attended First Baptist Church of Ovid, MI. Lexie is survived by her mother Holly Schueller of Ovid, MI; sister MacKenzie Schueller of Ovid, MI; brother Gage Coohon of Ovid, MI; grandparents: Tammy Perry and Mike Rowley of Laingsburg, MI; Bob and Tamara Schueller of Eureka, MI; great-grandmother Lois Perry of Ovid, MI; great-grandfather Jerome Schueller of St. Johns, MI. Lexie is also survived by many special aunts, uncles and cousins, and several close and special friends. Lexie was preceded in death by her great-grandfather Lawrence Perry; great-grandmother Kay Schueller; and great-great-grandparents: Harold and Helena Burk; Lyle and Eva Thompson; and Albert and Irene Schueller. Memorials may be made to the Wishes of Lexie's Family. Online condolences can be sent to www.smithfamilyfuneralhomes.com. The family is being served by Smith Family Funeral Homes - Houghton Chapel, Ovid, MI.